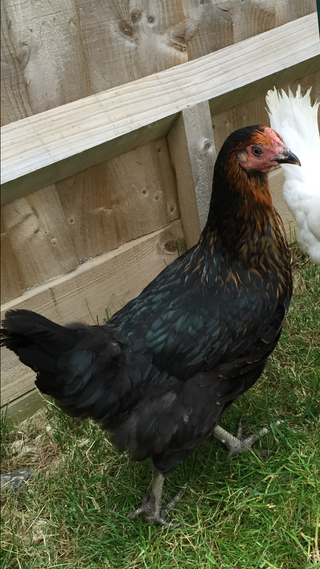 Miss Pepperpot is a modern hybrid and is the result of a Rhode Island Red crossed with a Maran and a Plymouth Rock. They are superb egg layers and have a thick rich plumage which protects them from the elements. 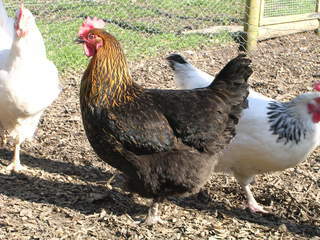 They are attractive birds with a small red semi-erect comb which is mottled with black. The beak is black and the legs are unfeathered and slate grey. They have four toes. 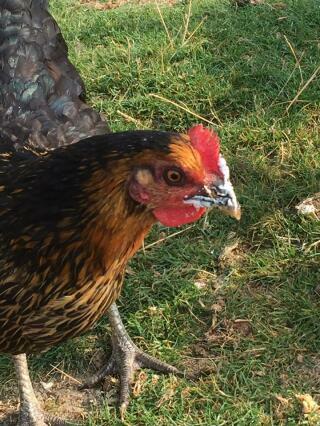 The face is smooth and they have small smooth red wattles and earlobes. 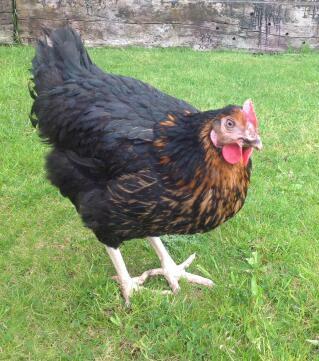 Miss Pepperpot is a prolific layer of large to extra large brown eggs. They are docile birds and easy to handle so make wonderful pets. They are ideal for free ranging but can be just as happy kept in a run. They are also very hardy birds and can cope with most weather conditions and are disease resistant. Only available as a female, they have black feathers which have an attractive green sheen towards the back and tail. They have red and gold feathers with black tips on the chest and some gold feathering in the hackle. The eyes are deep bay and the legs are slate grey. Description: Fully vaccinated, friendly docile breed. Excellent layer. We also sell the Eglu Go and Go UP. Demonstrators available to view. We are based in Leatherhead, Surrey and visits are by appointment, so why not give us a call today? Tel 07963 013597. We started with 3 hens and now only have the one left. She is at least 11 this year and randomly lays an egg very so often although we do not eat them anymore as not usually that good. She rules the garden and keeps the dog in check, if you open the back door she is in the house having a nose around. Very friendly and a real character! Would recommend the breed to anyone but be prepared they are not a short term pet by any means. She has been on her own now for about 5 years and still looks as healthy as when we first got her!!! 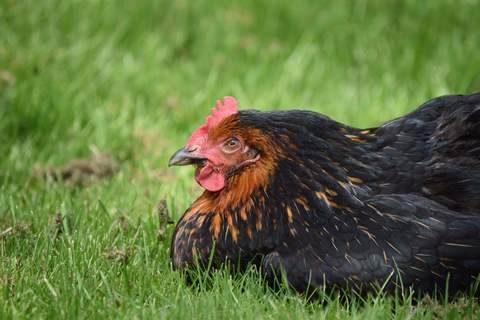 Fabulous hen - ours has grown into a large sturdy hen, she lays 6-7 large brown eggs a week. She is a confident and inquisitive girl who quietly but firmly keeps the others in their place. 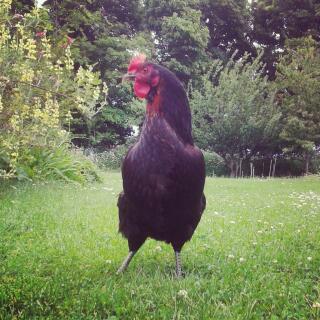 She is partial to a little treat of grain and enjoys free-ranging and foraging in the garden. I am staggered by egg production. 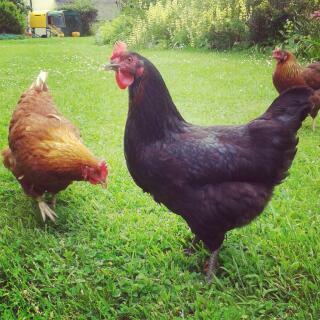 All 5 lay an egg a day and did throughout our long cold winter 12/13. Our only problem is their morning egg song. Very loud for about an hour. Its lovely but 6am in May - i have not had any complaints yet but will wait and see. 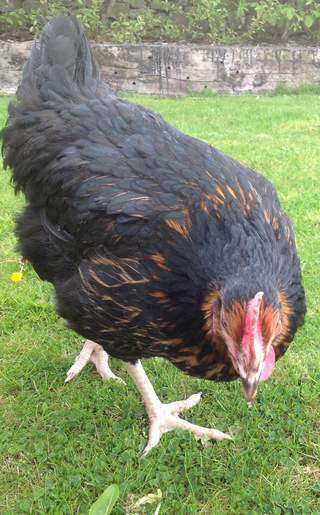 m=My miss pepperpot Hoppy lights up the garden when shes there and is friendly i found that its all about gaining trust with your chickens she is two years old now and still laying fresh eggs everyday. 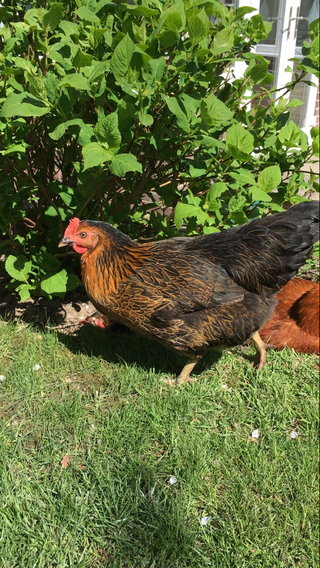 They are great pets for kids, i am a teenager and i look after my three chckens i find them easy to clean and fun to be around.